Did Trump Revive Failed Cold War Cuba Policy to Buy Rubio’s Loyalty? The one exception to this see-no-evil policy is Cuba, where Trump has moved to reimpose failed Cold-War sanctions, ostensibly to pressure the island nation to improve human rights. How can we understand this seeming contradiction? The answer may be close at hand – indeed, standing right next to the president. The president had reportedly been advised by the Departments of Commerce, Defense, State, Treasury, Agriculture and Homeland Security not to reinstate sanctions on Cuba which had been rolled back by President Obama. The generally Republican-leaning Chamber of Commerce and National Association of Manufacturers, too, have supported keeping Obama’s steps towards normalization in place, as do Human Rights groups like Amnesty International and Human Rights Watch. All of these believe that America’s 57-year effort to isolate Cuba has been a failure and is bad for Americans and Cubans. 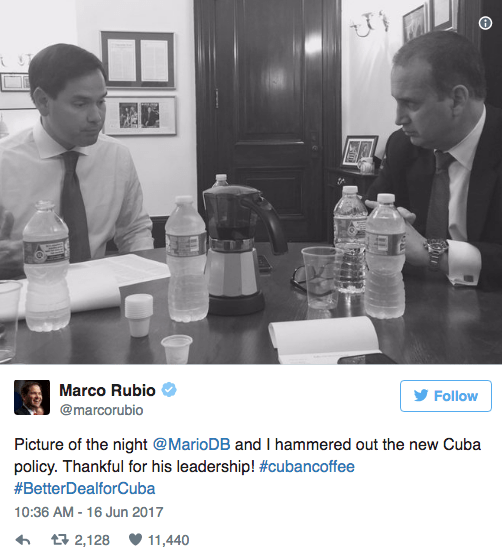 But as reported by The Miami Herald, Politico, and Mother Jones, one man in particular – Florida Senator Marco Rubio – intensively lobbied Trump with fellow Miami Cuban Rep. Mario Diaz-Balart to reimpose the sanctions. Rubio seemed more interested in getting Comey to publicly admit that President Trump ‘was not personally under investigation’ than in obtaining any new evidence for the Senate investigation. It was as if Rubio…was acting as Trump’s defense attorney instead of as a member of a bipartisan committee investigating crucial national security issues. It’s fair to ask if this is a quid pro quo. Rubio is a member of the Senate Intelligence Committee, which is actively investigating possible links between the Trump campaign and Russia, and now possible obstruction of justice. He has used his position to defend Trump in both public hearings and in statements to the press. Indeed, it’s fair to ask if such a deal between Trump and Rubio could in itself constitute an obstruction of justice. Special Counsel Robert Mueller should require Rubio, Rubio staff members, and others with knowledge of the dealings between the two on Cuba policy to answer whether Trump directly or indirectly asked for Rubio’s loyalty in the Russia investigation, and whether Rubio directly or indirectly promised any loyalty in exchange for Trump accepting Rubio’s Cuba policy. In a further irony, Trump’s policy of isolating Cuba from the United States helps Russia, adding another coat to the Cold War-patina of the deal. The loss of revenues from American tourists and business will likely lead Cuba to turn back to Russia as an economic, and even military, patron. Russian has recently forgiven billions of dollars of debt owed by Cuba and has once again become a major supplier of oil to the island, replacing Venezuela which is in the midst of its own political and economic crisis. Finally, Trump’s Cuba policies may gain him personal economic advantage over The Trump Organization’s competitors in the hotel industry. Starwood Hotels, which was recently acquired by Marriott, has negotiated deals to manage several hotels in Cuba, some of which are partly owned by Gaviota, a tourism company owned by the Cuban military, which, in socialist Cuba, is widely involved in the Cuban economy. Other major American hotel chains hope to use the Starwood deal as a template for their own expansion into Cuba. These efforts by the American hotel industry to invest in Cuba will likely be slowed or halted by Trump’s new Cuba sanctions. But Trump himself told CNN last year that he would like to open a hotel in Cuba “at the right time,” And The Trump Organization has been exploring investing in Cuba hotels since as early as 1998, sometimes in violation of U.S. law. A company controlled by Donald Trump… secretly conducted business in Communist Cuba during Fidel Castro’s presidency despite strict American trade bans that made such undertakings illegal, according to interviews with former Trump executives, internal company records and court filings. Documents show that the Trump company spend a minimum of $68,000 for its 1998 foray into Cuba at a time when corporate expenditure of even a penny in the Caribbean country was prohibited without U.S. government approval. In 2012 and 2013, Trump Organization officials again travelled to Cuba to explore opportunities to open golf courses, according to Bloomberg Businessweek. These included Trump Organization executive V.P. 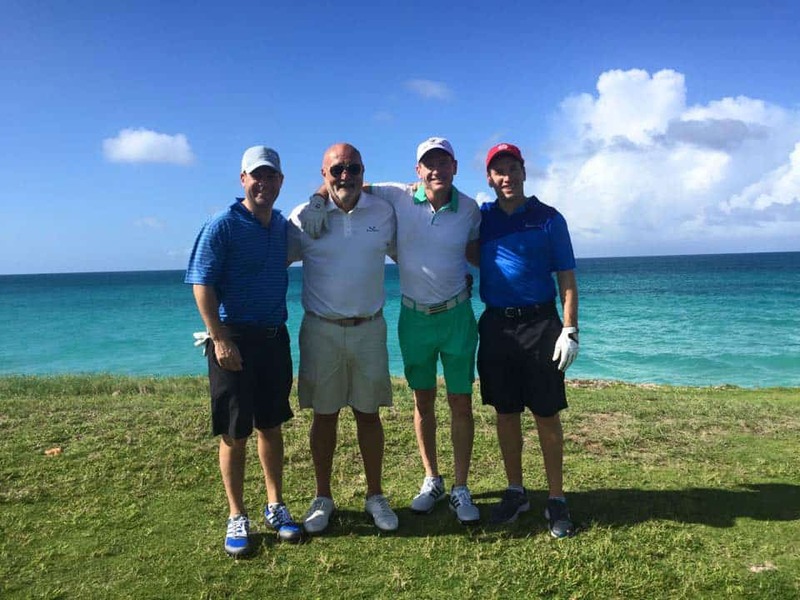 Larry Glick, environmental consultant for golf Edward Russo, chief legal officer Jason Greenblatt, and Trump golf executive Rob Lieberman. So – Trump’s new Cuba sanctions earn him an important political ally in Rubio, harm his business competitors and potentially give the Trump Organization time to catch up before his competitors get too far ahead in establishing American-managed hotels on the island. And the new policies help Russia. There’s plenty here for Special Counsel Mueller and Congressional Committees to look in to. Things could start to get even more interesting than they are already.